While the Roadhouse might suggest an affinity with blues, don't be fooled. This truly is a guitar for everyone. The Noiseless pickups and 305mm fingerboard radius conspire to make this the best-sounding and most playable Strat under a grand. A guitar this good deserves a better quality gigbag. 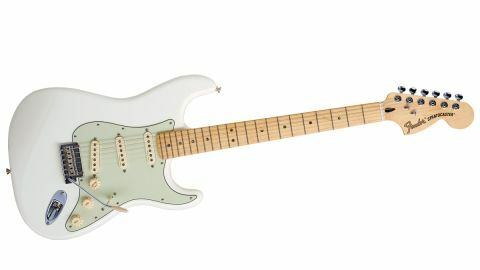 New for 2016, Fender has shown the spec sheets of its popular Mexican-built Deluxe Series Roadhouse Stratocaster model some love to create a reboot that comes seriously well appointed. The upgraded model features an alder body, sprayed in flawless gloss polyester, and bolt-on maple neck, with the option of maple and rosewood fingerboard, finished with satin polyurethane. Keep sniffing around and you'll find other features like the 'Modern C' neck profile, 22 narrow/tall frets, a contoured neck heel, synthetic bone top nut and a set of locking tuners with vintage-look buttons. One of the most crucial upgrades, however, is something you can't see with the naked eye. While the previous editions of the Roadhouse and came with a 241mm (9.5-inch) fingerboard radius, the new model packs a flatter 305mm (12-inch) camber. Yes, the same radius as a Gibson Les Paul. Look, Leo Fender and his boys in Fullerton, California, pretty much got everything right when they put together their first guitars in the 50s. Above all, it's the vintage 184mm (7.25- inch) 'board radius that alienates some players. That old-school radius works just fine when you're thumping out chords, but it can cause the strings to choke out when you bend above the 12th fret, unless you hike the action to compensate. Some forum jockeys have dismissed Noiseless pickups as underpowered and uninspiring. We beg to differ. Fender's solution was to introduce the modern, flatter 241mm radius you'll find on the majority of its guitars these days, including the Custom Shop Time Machines and Artist models. The result is easier string bending, plus a lower action. The 305mm 'board radius on these new Deluxe model is flatter still. The previous Deluxe models came with and Texas Special Roadhouse pickups. Note the use of past tense here. The new Roadhouse features three Vintage Noiseless (1st generation) single coil-sized humbuckers wired to a five-way pickup selector blade switch, and master volume and tone controls. Lurking between the volume and tone knobs is the V6 preamp control, a six-position rotary switch that gives you access to a series of tweaked single-coil tones. The preamp is activated by the S-1 switch located on the volume knob, and fuelled by a nine-volt battery accessed via a spring-loaded flap on the back of the guitar. The playability of this guitar is outstanding. Fender could have easily whacked a set of fat frets on the Roadhouse, but we like the vintage vibe of these 'narrow-but-tall' jobs. We can't imagine anyone taking issue with that shared Modern C neck profile, either. It's slim and fast, especially with that drag- reducing satin polyurethane finish, yet there's still enough palm-filling wood to remind you that you're not dealing with some skin and bones shred machine. The 305mm fingerboard radius is a revelation. The action in both guitars is set low, but there's no choking or buzzing to get your blood up, if you have a light touch. Some forum jockeys have dismissed Noiseless pickups as underpowered and uninspiring. We beg to differ. Plugging in the Roadhouse reveals a slew of classic Strat tones. Okay, this isn't some roaring rock beast, but remember, some of Jimi Hendrix's most cherished tones were created on Strats with the lowest output single coils. Those pickups exploited the natural tone and woodiness of the guitar, and that's what's going on with the Roadhouse. The Noiseless pickups live up to their vow of silence, making them indispensable in a recording situation, but that ability to thwart the pesky 60 cycle hum doesn't come at the expense of tone. In fact, the regular pickups are so addictive that we almost forgot this thing has a built-in active preamp. The V6 offers a range of sounds from thin and weedy to a much more usable fatter voice, the latter not a millions miles shy of a P-90. The remaining four increments are subtle to say the least and - with respect to the lad or lass with the soldering iron and a dream who designed the thing - we have to say the V6 is not this guitar's major selling point. It's fun to fiddle around with, but the truth is we prefer the perennially classic non-preamp tones. The previous Deluxe Roadhouse was bloody good, and you'll likely find shops flogging them off at clearance prices to make space for the new versions. Don't pull that trigger just yet. This year's models up the ante with greater playability and pickups with the ability to cut it in the studio without driving the engineer up the wall. Aside from the flimsy gigbag included with this guitar, we can't fault it on performance or price.